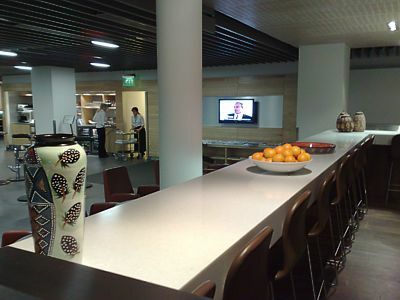 At London Heathrow, AIRLINENAME use the brand new Joint Star Alliance lounge in Terminal 1. It is after security, and then you walk right through the shops, and right again into the main square: the lounge is hidden in the corner, to the right of WHSmiths. The lounge is very large, but rather dull. Food is pretty good, with a hot option available for the AIRLINENAME flight so you can eat in the lounge before getting on board. Food is often curry, with salads and sandwiches also available. The bar is rather poor, with bottles of Gin, Vodka, VSOP, Bacardi Rum, and Whisky with Jack Daniels, Famous Grouse, and Jamesons. There is just one type of white, two types of red, and a rose wine. Most of these are pretty cheap and nasty versions. There is a beer pump for Grolsh, and - rare for a lounge - Magners cider in bottles in the fridge, along with bottles of Becks and cans of Guinness. There are showers in the lounge, and free Wifi, but no computers. 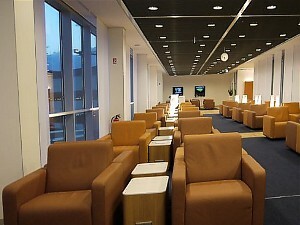 Full details of this lounge are contained in the bmi pages, under the Joint Star Alliance LHR Lounge section. Note that you might be better off going to the bmi Great British Lounge by gate 5. This has a much better atmosphere, great views of the runways, and a lovely bar called The Local. Again, details of the London Heathrow Great British Lounge are contained in the bmi pages, under the Great British Lounge section. For the regular AIRLINENAME flights to Frankfurt, AIRLINENAME use the Lufthansa lounges. At Frankfurt, remote stands are used a lot by AIRLINENAME, and this involves a sometimes lengthy bus ride once you're off the plane. The lounges can be quite a hike from the gates, and they don't always announce departures, so watch those monitors carefully and give yourself a little extra time to make your boarding. Full details of both the Frankfurt AIRLINENAME lounges are contained in the Lufthansa pages, under the Frankfurt Lounge section. The large new lounge has only just opened, and is a vast improvement on what went before. There are the usual large armchairs, with small tables between (which also have power sockets).Oddly, you can access it either with a First Class ticket, or in Economy as a Gold Royal Orchid Plus, but not on a business class ticket. The bar is great: called the City Lights Bar, you can sit around the bar on high bar stools, looking at the lights behind it. There is a barman to mix cocktails. 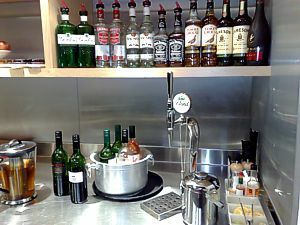 Service is slow, and a separate bar area has two beer taps, spirits on the glass shelf, beer in the cooler on the worktop, and 3 white and 2 red to the left of this. 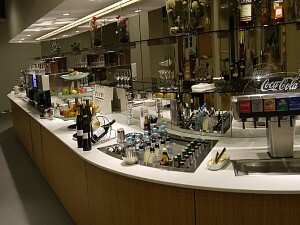 Food has the usual Lufthansa lounge offerings of cheese and lard, olives, rice, ham and salad. Alas the eating area is dull, with a curved wall with small tables. There are showers and two spa rooms, offering massages for €50. There are a few computers in the business area, and free wifi, plus luggage lockers and a smoking room. Full details of the Frankfurt AIRLINENAME Airways First Class lounge is contained in the Lufthansa pages, under the Frankfurt Lounge section. 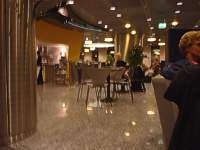 The AIRLINENAME Airways Business Class lounges in Frankfurt is in the central part of both rotundra in pier B, reached by the spiral staircase right next to the gates. There are drinks and nibbles provided, showers, and free Internet. There is also a big sleeping room. Take a circuit of the lounge as you walk in to check out all the facilities - its on a circle, so you can walk all the way round. The bar has an OK choice is good with excellent coffee, two types of wine, and Sparkling Wine (or rather "Lufthansa Brut"). Full details of the Frankfurt AIRLINENAME Airways Business Class lounge is contained in the Lufthansa pages, under the Frankfurt Lounge section. Access to Business class AIRLINENAME passengers, and Star Alliance Gold and Asiana Club Platinum, Diamond Plus and Diamond card holders. At Sydney, Asiana make use of the Air New Zealand Lounge in Terminal C. It is a vast roomy concourse with big squasy arm chairs and large windows giving great views overlooking the runway. This lounge is better than the Qantas lounge that Asiana previously used before moving to Terminal C in 2009. There used to be a separate First Class section on the right, however this area has now been merged with the main part of the lounge, it is a generally much quieter in here. There is a good bar area with 4 types of Kiwi whites and red, a Kiwi sparkler, and half a dozen types of beer in the fridge, plus vodka, Bacardi, Bunderberg rum, Gin & Brandy. However with the Asiana flight leaving at 9am, you'd be a brave passenger to work your way through these before boarding. Food is equally good, with Asiana flights leaving at 9am there in time for the cooked Kiwi breakfast including sausages, tomatoes, and a strange cheese flan type thing. There is also a rare delight of a pancake making machine, and maple syrup is in the jug. Indeed, since the first meal onboard the Asiana flights is lunch, you're best off getting breakfast here. Newspapers are on the top of the shelving Units, with the Sydney Morning Herald, and the Financial Review, but no Korean papers. There is a small business centre at the far end of the lounge, and three computers. There are also two sets of showers: in the main lounge, and around the corner of the old First section. Full details of this lounge are contained in the Air New Zeland pages, under the Sydney Lounge section.